I had arrived from Kenya on July 22, 2011 to be with our daughter and her family as they waited for the birth of their second son. We had spent a few months wondering if there really was a need for me to make the long trip. After all, our regular furlough time was schedule for later in the year and Stephanie was progressing well with this pregnancy, and there had been no complications with their first baby either. We all knew that being a foreign missionary sometimes meant missing important family events and the cost for such short international trips was very expensive. In addition to the cost, there was also our own work schedule on the mission field that would be affected. I was in the middle of our school year with teaching the women’s classes in our Bible institute and leaving before the year ended meant doubling our work load to finish the course. But still, with knowing all of this, the Lord was strongly impressing upon my heart the need for me to be with my daughter and her family for the birth of our second grandson. Whatever reasons we found for me to not make the trip were overshadowed by the Lord’s clear leading and by June my husband had booked my flights and made his decision to join me five months later for our regular furlough time. It was eight days after my arrival that our grandson, Kacey Guy, was born. He was full-term, born on July 30, 2011 weighing 7 lbs. 9 oz. I was just outside the room when Stephanie delivered and could hear Kacey’s wail-of-a-cry that said everything was alright… but everything wasn’t alright and Kacey was in need of a miracle. Kacey Guy moments after he was born. Sedated and on life support. Our baby boy was born with a heart deformity that would take his life if surgery could not be performed. This deformity of his heart is called Transposition of the Greater Arteries/Vessels (TGA). To understand this deformity, imagine looking at a diagram of the body’s circulatory system, the red and blues indicate the blood flowing to and from the heart and the purpose of this flow is to carry oxygenated blood throughout the body and then return it to the heart and lungs to be refreshed and repeated… now imagine that when the arteries joined the heart that they were switched, connected to the wrong valves. Blood flowing back to the heart was trying to enter through the out-flow valve, and vise versa. Oxygenated blood was being transferred to only his lungs and heart while the rest of his body, including his brain and other vital organs, weren’t getting any oxygen. Added to this complication was a condition with his lungs known as PPHN (pulmonary hypertension) in which his lungs were not “soaking up” the air he was breathing. Within minutes after his birth, Kacey was put on full life-support, and I began making the phone calls to tell family members of Kacey’s urgent need of prayer… many prayers. Kacey was very much in a moment by moment crisis situation, and we prayed for enough time for doctors to fully evaluate Kacey’s condition and time for them to plan their course of treatment and the eventual surgery that could possible save his precious life. Our baby boy needed a miracle… many miracles. Little did we know but our Kacey had begun his journey of many miracles. Mommy (Stephanie) with Kacey Guy before he is airlifted to Children’s Hospital in OKC. Three hours after Kacey was born, he was airlifted from the women’s hospital to the children’s hospital. And, as soon as it was possible for Stephanie to move on her own, I was pushing this very weary and worried momma around the children’s hospital trying to find out where her baby was and what was happening to him. Everything had happened so quickly that Stephanie did not have a chance to hold Kacey, or even have time to get a good look at his sweet little face. The next time we saw Kacey, his face was covered with tubes and tape and he couldn’t be held because of all the IV’s that were insert into various parts of his little newborn body. A surgical team was called in… they were going to insert a balloon catheter into his heart to punch the hole and make it larger while medications were being given to fool the body into thinking he was still in the womb. All this was done so he could get oxygen throughout his body instead of it recirculating only to his heart and lungs. It was a successful attempt to prolong Kacey’s life but other complications started happening. Within Kacey’s first week of life (July 30th to August 5th)… his left lung had collapsed and a chest tube was inserted to re-inflate his lung. Kacey had crashed 3 times (meaning his heart had slowed to the point of needing stimulation)…, he started having seizures…, and a blood clot was detected. He was on blood pressure medications to regulate his heart, seizure medication to stop seizures, other medication to sedate and paralyze his little body to keep him still so he wouldn’t fight against the respirator or pull against the IV’s and PICC Line (peripherally inserted central catheter) that were inserted into his little body. Kacey was on so much medication that his little 7lbs. 9oz. body was now weighing over 11 pounds… this was because of all the medications he was on and the fluid he was retaining. Then, doctors told us Kacey was on all the life support they could give him, and he still wasn’t getting any better. The cardiologist also thought Kacey was not a candidate for corrective heart surgery because TGA with PPHN put Kacey into another category and he was too high a risk for any hope of a successful outcome… they were preparing us for Kacey’s death and we needed a miracle for his life to continue. A last hope effort was suggested… airlift Kacey to Arkansas Children’s hospital for the lifesaving six-hour heart surgery he needed. Doctors were not sure if Kacey would survive the trip, let alone become stable enough for the surgery. He was air-lifted to Arkansas on the following Saturday (August 6, 2011) and we followed by car. When we arrived at mid-night, Chad and Stephanie checked on Kacey while I kept his older brother, Kayin, with me. Kacey had survived the three hour helicopter transport but he would have to stabilize before doctors would even consider putting him on their surgical schedule. We had no idea how to plan for our stay in Arkansas and so we thought it would be best to see if we could get a room at the Ronald McDonald house across the street. Monday morning was our first chance to ask about a room and we were told seven families were already on the waiting list. But, by Monday afternoon, we were called by the folks with the McDonald house and told a room was now available for us. We do have family living in Arkansas but no one family member lived close enough to the hospital or had enough room to take in three adults and a 22 month old toddler for an unknown length of time while we waited to see what would happen with Kacey. Daddy (Chad) holding big brother, Kayin, as they watch over Kacey Guy. After arriving at the Arkansas Children’s hospital, Kacey was still in a moment by moment crisis situation, it was three days later that he finally started to show signs of stabilizing. Doctors gave him another week before they listed him on their surgical schedule. Finally, we had a surgery date but his date was bumped because of a more time sensitive situation, it was a heart transplant for another baby. Kacey was rescheduled but the same thing happened when another heart became available for another baby. Arkansas Children’s is the best children’s heart hospital in the nation and that means they stay busy giving their attention to the most time sensitive cases. It was good news to us that Kacey was stable enough to wait, but this waiting still put us on edge. For the third time Kacey was scheduled for surgery and on August 30th the six hour open heart surgery to correct his fatal deformity was successfully performed. Kacey was finally on his journey to recovery… so we thought. Kacey had been so long on the addictive pain medications that he was having terrible withdrawals as the nurses were working to wean him off. Then, eight days later, Kacey was flown back to Oklahoma for his in-hospital recovery and everything looked well… but it wasn’t long before doctors discovered something else was wrong with our baby boy. Kacey Guy just after his heart surgery at Arkansas Children’s Hospital. Within the first week of his recovery, Kacey was not tolerating stomach feeds well, nothing would stay down and it was determined that another surgery was needed. Kacey had a defect called pyloric stenosis in which a section of flesh between his stomach and intestines was clamped off, not allowing the contents of the stomach to pass on to the intestines. This surgical procedure is typically done on an easy out-patient basis, but with Kacey still recovering from his open heart surgery, and with the blood thinner injections he had already been receiving for blood clots, this easy surgery became complicated. Not wanting to risk any more pressure to the heart with a laparoscopic procedure, another incision was made to correct this defect. The surgery was successful and Kacey began the stomach feeds again. Only a few decades ago, and even in some parts of the world today, these surgical corrections could not be made due to either a lack of medical knowledge, or the lack of technical equipment and death of the infant was imminent if not corrected soon after birth. With being on the mission field, we know that our grandson would not have had any hope of life if he had been born in Kenya. After spending 72 days in the hospital, Kacey was finally able to go home on October 10, 2011. It took a journey of miracles for his life to continue and we thank the Lord, not only for Kacey’s life, but the quality of his life. I do believe science has discovered many medical procedures and techniques, but I do not believe that any scientific knowledge came without God’s intercession. (Proverbs 2:6 “For the Lord giveth wisdom: out of his mouth cometh knowledge and understanding.” Job 32:12 “But there is a spirit in man: and the inspiration of the Almighty giveth them understanding.”; Daniel 2:21, 22 “…He giveth wisdom unto the wise, and knowledge to them that know understanding: He revealeth the deep and secret things…”) My grandson’s life is the result of medical knowledge and technical equipment… but my grandson’s quality of life is a miracle given by God. 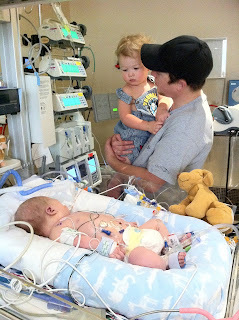 Kacey will be a year old on July 30, 2012 and he is doing amazingly well. He currently does not need or take any medications. We know that he will always be a heart patient and need regular checkups on his heart. Doctors have also told us that the process of evaluating Kacey’s long term health and well-being will continue for the next few years. Thank you Lord that our baby Kacey not only lives but has quality of life beyond man’s understanding or expectation.